Animals come in sorts of shapes and sizes, but why they have to be so different from each other remains a mystery to evolutionary biologists. But a recent computer simulation suggests that body types remain simple when placed in simple environments, but evolve into complex shapes when things get challenging. Evolutionary biologists are interested in how the complexity of an organism's body plan, or morphology, is influenced by the complexity of the environment in which it evolves. Needless to say, it's impossible to watch evolution in real-time given the extreme time spans involved. To overcome this, computational biologists Joshua Auerbach and Josh Bongard employed simulations capable of evolving the body plans of virtual organisms. Their results now appear in PLoS Computational Biology. To get their virtual organisms to evolve, the researchers developed a scenario in which 'survival of the fittest' (i.e., selection) meant 'survival of the best means of locomotion.' 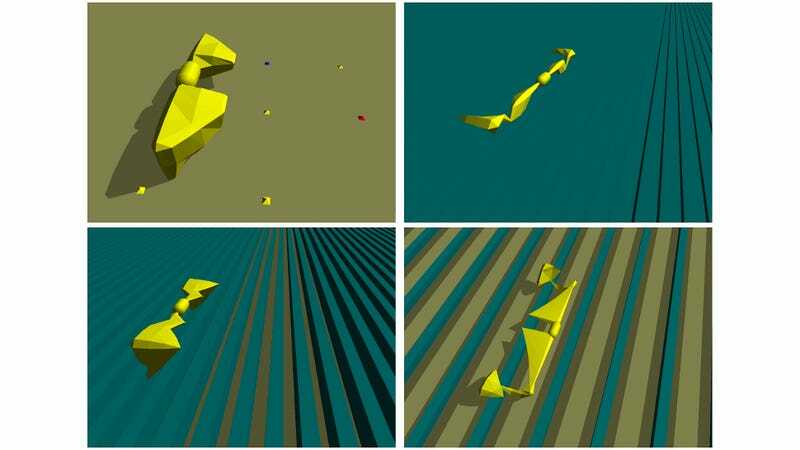 But unlike previous simulations involving overly simple and flat environments, Auerbach and Bongard introduced their virtual animals (or bots, depending on your persuasion) to complex environments, namely surfaces consisting of two types: a high-friction terrain and a very low-friction surface akin to a sheet of ice. As Auerbach and Bongard discovered, organisms have little choice but to adapt when environments get tricky. Their control group was placed on a flat, high-friction surface, while the experimental bots were placed on high-friction surfaces with rows of ice. Over the course of many mutations and selection, the winning body-type was one that could reach into the gaps between ice bars and pull across — meaning that they had to evolve more advanced appendages. Fascinatingly, complex environments instigated rapid evolution — a phenomenon that evolutionary biologist Stephen J. Gould would have referred to as punctuated equilibrium. "By evolving virtual organisms for locomotion in a variety of environments, we are able to demonstrate that selecting for locomotion causes more complex morphologies to evolve than would be expected solely due to random chance," wrote the authors in the study. Indeed, as the researchers discovered, the more challenging the environment, the more costly is it to an organism, and by costly they mean the imperative to evolve more complex body plans. This is what's referred to as the "arrow of complexity" hypothesis — the idea that the most complex outcomes of open-ended evolutionary systems tend to increase in complexity over evolutionary time. Now, this is not as straightforward as it may appear; many incredibly simple organisms (like single-celled organisms) continue to exist in massive numbers (showing that a tendency towards complexity is not the rule, but probably the exception), and that some animals even evolved to lose their morphological complexity. But as this new study clearly demonstrates, environmental niches matter — and they matter a lot. Interestingly, this work was partly funded by DARPA. The advanced-concepts research wing is likely looking at this as a way to "evolve" more effective robots. Read the entire study at PLoS Computational Biology: "Environmental Influence on the Evolution of Morphological Complexity in Machines."